In celebrating Pohela Boishakh 1417, Tohu's Creations, in bringing out their latest collection, has incorporated all the colours of the season, particularly red and white, as themes that represent the festive occasion. The line includes everything from saris, to panjabis, shalwar kameezes, children's wear, etc. Contact: 01711934851. Like every year, Kittonkhola has brought out a diverse line of spring wear to mark the onset of Boishakh. Done in the concept of Radha Krishna , this season's line of saris, bejewelled shalwar kameezes, panjabis, fatuas and tops are decked in colours of white and red, and also the usual colours of orange, yellow, lemon green and blue. The materials used were taant cotton, endi cotton, endi silk, half silk, cotton silk, silk, etc. and the clothes are done in block print, karchupi, kantha stitch, machine embroidery and sequins. Saris will be available from Tk 950-3000, shalwar kameez sets from Tk 1050-2500, panjabis from Tk 500-1200, fatuas and tops from Tk 450-1200. The Bengali New Year signals the time for celebrations among all Bengalis. Fashion House “Design Roots” has tapped into the festive spirit of the season and brought out a line specifically tailored to the theme of Boishakh. Created from Taant fabrics in the favoured seasonal colours of yellow, red, green, orange and blue, the fashion house showcases panjabis, saris, shalwar kameez, and fatuas. These are done in designs such as appliqué, block, paint, hand embroidery, sequins, beads, etc. These will be available this Boishakh at the “Design Roots” showroom. This Boishakh fashion boutique 'Traditions' is carrying cotton and muslin saris done in appliqué, block and hand embroidery. 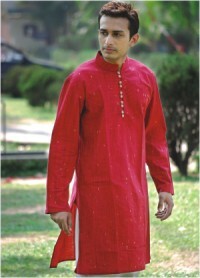 There are also attires for young men and women, and couples including panjabis, fatuas and tops. One of the most important attractions of the Auto Expo Dhaka 2010 is having all the requirements of would be car-owners under one roof. Organised by Autoline Magazine and UCBL (United Commercial Bank Limited), and supported by BARVIDA (Bangladesh Reconditioned Vehicle Importers and Dealers Association), the fair was inaugurated by BARVIDA President Md. Habibullah Dawn on the afternoon of March 25 at the Bangabandhu International Conference Centre. The three-day fair, ending on March 27, is the second such event, with last year's version also organised by Autoline Magazine and BARVIDA. At the inauguration, the guests included Md Habibullah Dawn; General Secretary of BARVIDA Mahbubul Haque Chowdhury, Autoline journalist Ahsan Habib, UCBL representative Mizanur Rahman and Southern Automobile Managing Director Manaranjan Bhakta. All the guests agreed on the need for cars in modern society, and how reconditioned cars have increased affordability among the consumer class. They acknowledged the problems of congestion that Dhaka is faced with, but said to solve the problem the government needs to bring in experts, and that blaming the proliferation of reconditioned cars would not help. The fair had everything a potential automobile consumer could need to complete a purchase and start driving. From stalls of banks such as UCBL, DBBL and EBL set up to discuss and approve car loans, car security companies like Nexdecade Technology that will track stolen vehicles through GPS, to stalls of CNG conversion companies. All this is in addition, to the numerous dealership stalls. Prospective buyers can choose to convert their cars to CNG before they take the car out of the fair; the dealerships will do the conversion in partnership with the CNG converters at the fair. The Auto Expo was marked with a festive atmosphere, with DJs playing groovy beats and food stalls to keep visitors refreshed and stimulated. There are also some brand new vehicles, notably a black Hummer just in front of the DJ station.